Located at the foot of the mountains directly West of Kyoto city, Oharano is an agricultural area that still retains the rustic charm of the countryside, even though it’s located in the city limits. Oharano is well known for it’s many bamboo farms where takenoko (bamboo shoot) is harvested every spring. The farmers here take pride in their hard work unearthing one of Kyoto’s cultural delicacies. 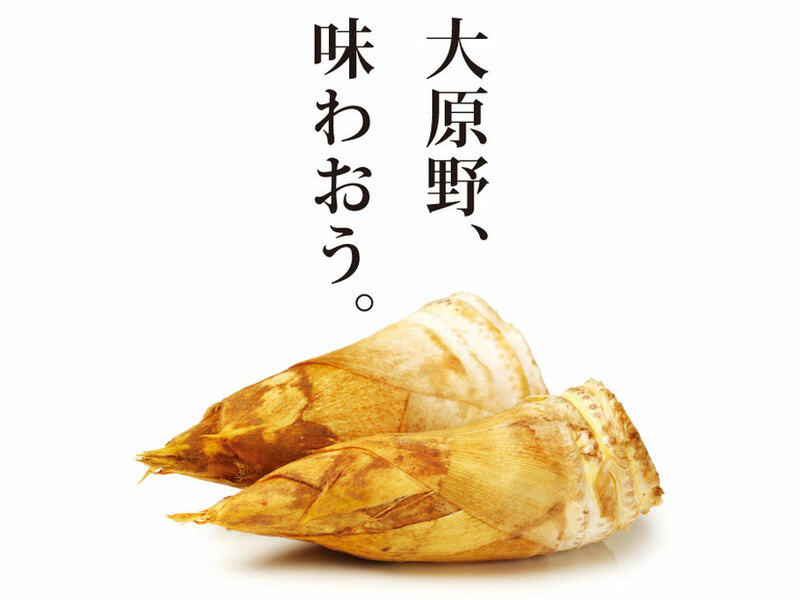 We’d like to share with you a few ways you can come to Oharano and enjoy Japan’s best bamboo shoots. 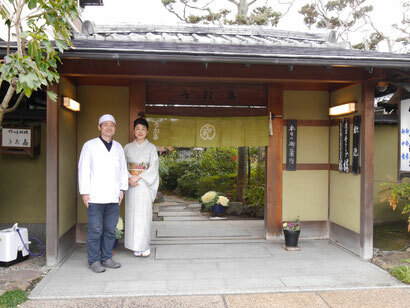 If you’re the type that enjoys the culinary arts, then the best way to enjoy bamboo shoots in Oharano is to eat at Uoka, the only restaurant bamboo shoot courses. 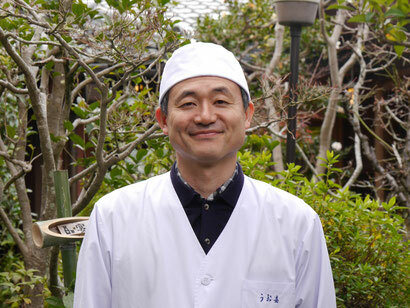 The local restaurant’s chef, Mr. Komatsu, is passionate about his work and spoke to us about why it’s important to him. The Nishiyama area, including Oharano, produces the most delicious takenoko (bamboo shoots) in Japan. 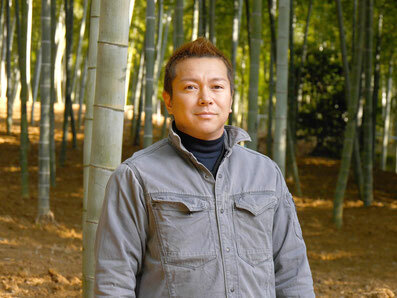 I believe there are three important conditions that make the area perfect for bamboo. The slopes here are gentle, not steep, which is suitable for farmers. There’s lots of slow-flowing water making the ground moist, and the soil is fertile and rich in minerals. It’s a rare combination benefiting both the bamboo and the farmers. The bamboo shoots here are one of Kyoto’s culinary treasures. A long time ago the country put a lot of effort into bamboo research and cultivation. This area was designated as a “soft earth farming area” specifically for bamboo farms. Specialists discovered that spreading a mineral-rich earth helped to make the bamboo shoots more delicious. When bamboo shoots break from the ground, they become hard and bitter, but in the ground they’re soft and sweet, so farmers needed a way to dig out the soft shoots from deep under the ground. The tool invented is called a horigua, and it’s unique to this area only. I really respect the local farmers. Their craftsmanship, or “farmership” as I like to call it, is amazing. They take pride in their hard work. This working culture is the foundation of delicious takenoko. Did you know they spread new soil every year? They’ve been doing it every single year since the Meiji area, through wars and other hard times. Every year! That’s why we have the best. Uoka’s name comes from the founder, Kakichi, who used to sell fish (Uo in Japanese) here. It’s Uo and Ka. 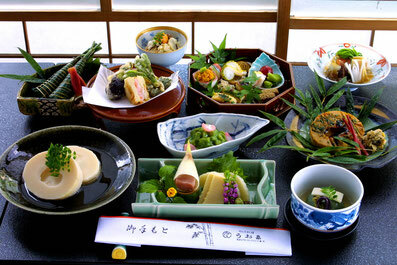 A long time ago, in the Meiji area, people started travelling Japan more and wanted to sample local dishes, which is why bamboo shoots became more popular. Our restaurant started getting a reputation as serving up delicious local ingredients, and word of mouth has brought us to where we are now. Many people don’t know how to cook takenoko. 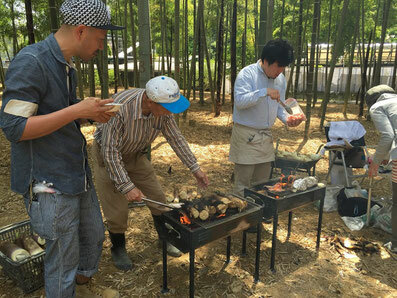 Our role in Oharano is to fill the information gap; to show people how these wild bamboo shoots that push their way out of the ground can become delicious gourmet food. In this way, I guess you could say we are like “food designers”. Many people haven’t tried really good bamboo shoots, so they don’t know the difference. It’s also our job to show people the best. We mainly use locally grown shoots because they’re the best. That’s how good they are here. One of our goals is to make food that surprises people. I sometimes get a call from a local who has recommended someone to come and eat here. It’s real pressure to perform! We work hard to ensure that when people ask, “Where’s a good place to eat bamboo?” people say “Uoka”. I can’t let anyone down. All our course meals are good, but for first time guests we recommend the Chikumei course. It’s our traditional, standard course that we have been preparing for years. 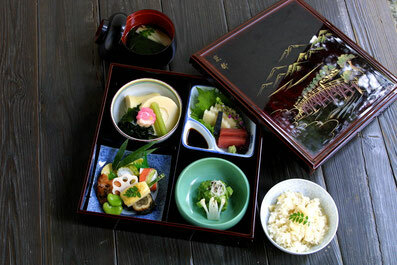 We also have bentos for people who are in a hurry, but if you’ve got the time you will enjoy the Chikumei course the best. Please visit us from the end of March to the beginning of May, during the harvest season, which is when we can offer you the best. Please call in advance before coming. 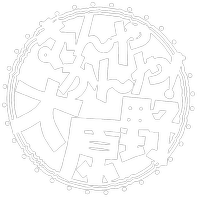 Reservations are recommended, and online reservations are possible from the website (Japanese only). Closed irregularly on days from Monday to Thursday. Evening meals on these days are by reservation only. 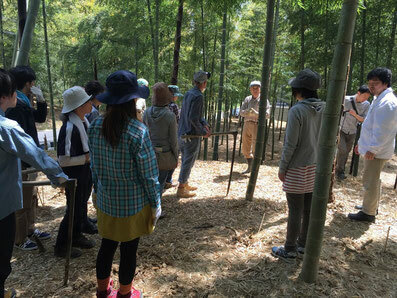 A bamboo shoot harvesting tour will be held in cooperation with farmers from the local area and the NPO Rakusai Lifestyle, which covers the Rakusai area including Oharano. Participants will be able to unearth their own bamboo shoots in an actual bamboo thicket, using the local ‘horiguwa’ (a special type of hoe). The hoe works as a lever to pull up the shoots without damaging their stumps. As the shoots are entirely underground, it takes a trained eye to find them. Farmers will be there to give you advice on where to dig, and how to use the hoe to help you pull them up. You'll come to know exactly how hard it is to master digging one up without damaging it or using too much energy. The harvested bamboo shoots will be wrapped in foil and BBQed for guests to share, and as they aren't astringent in flavour, you can eat them there are then. If you’re the type of person who loves cooking with fresh food and vegetables, you’ll enjoy going to buy fresh bamboo shoots, or having them delivered to you direct from local growers. The Western part of Kyoto is the only area in Japan where bamboo shoot farmers maintain their bamboo farms all year round to ensure that the shoots are as delicious as possible. When takenoko leave the ground they turn green and harden and become astringent in flavour. The best bamboo shoot is soft, white bamboo, and its flesh is as soft as butter. But it’s also the most expensive! 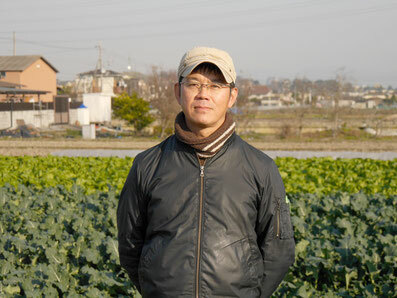 Farmers around here offer shoots in the standard (futsu), special (tokujyo) and the best white (shiroko) varieties. Prices vary, so please call any of the following farmers for more information. Prices: Anything ranging between ¥1,000 and ¥5,000 per kilogram is available (including Tokujyo and Shiroko). Please call for more information and to discuss your order. Payment: by bank transfer or cash on delivery.